How many authors in the world share your name? Wouldn’t it be nice to eliminate the confusion that it creates? Then register for an ORCID author identifier! An ORCID iD is the only tool you’ll need throughout your career to distinguish yourself from all other authors, unify all your scholarly products, and integrate your work with all funding, publishing, and other administrative systems. Recognizing the value of ORCID, Pitt has become an institutional member. Over the coming months, you’ll be hearing more about ORCID as HSLS launches a registration campaign throughout Pitt’s schools of the health sciences. First, ORCID resolves name ambiguity, making your work easily found. As a unique author identifier, the 16-digit ORCID iD persistently distinguishes each researcher from all others with the same or similar names throughout his/her career. Second, all of your work is processed accurately. ORCID integrates each author and his/her works, grants, datasets and more with all facets of the research/publishing infrastructure, from funding through submission and compliance, ensuring accuracy, and streamlining each process. Third, workflow improves for everyone involved by removing a major obstacle in digital scholarly communication: author ambiguity. Publishers such as Nature and Elsevier accept ORCID iDs to auto-fill manuscript submission forms. Upon publication, ORCID iDs populate bibliographic databases. When fully implemented, databases such as PubMed will retrieve accurate author citations. NIH offers the option of connecting to ORCID to automatically populate biosketches through NIH’s SciENcv. Academic institutions can simplify annual reporting requirements, which is why it is important to grant “trusted party status” to Pitt when registering. 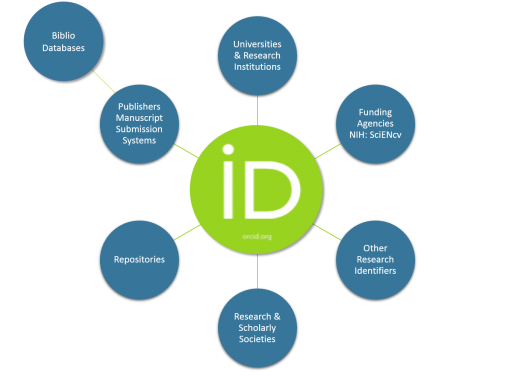 Using an ORCID iD, each author acts as the hub within a customized digital scholarly communication system. Use your Pitt e-mail address to register for an ORCID iD (and don’t forget to grant trusted party status to Pitt!) or wait for additional details from your school. For more information, visit the HSLS Guide to ORCiD@Pitt. Alternatively, contact your liaison librarian or e-mail Ask a Librarian.